Since 1998, New York City bike messengers have raised food for their city’s homeless the week before Thanksgiving. Like any other race, Cranksgiving tests your skills and speed navigating chaotic city traffic. However, unlike any other race, it tests the sharpness of your wits as you navigate the aisles of grocery stores searching for specific food items. 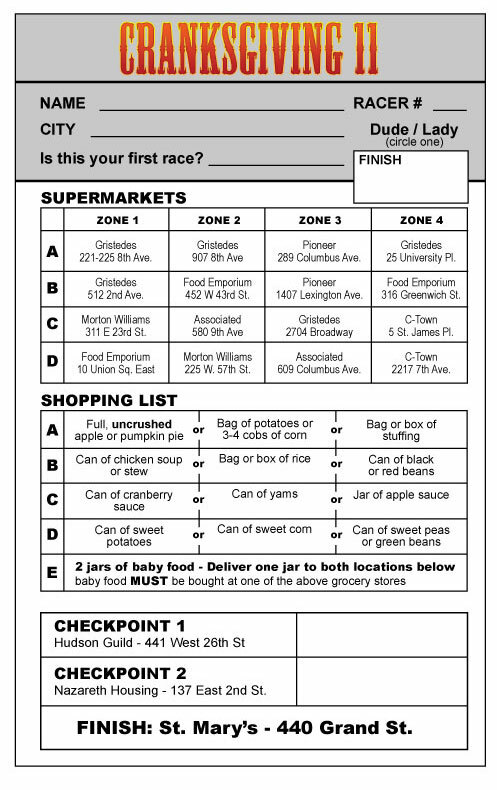 Once you’ve found them, made your way through the checkout lines and finished the race, all of your food will be donated to a local homeless shelter. 119 Racers! That was pretty awesome. In fact, if you count the three tandems, there were more like 122 racers. Thank you to EVERY ONE for coming out and continuing to make this event spectacular. This was the first race for at least 39 people, and there were 34 girls & 85 guys. This entry was posted by Doug D on November 2, 2009 at 12:01 am, and is filled under Events-Past, New York, Past Races and Other Events. Follow any responses to this post through RSS 2.0. You can leave a response or trackback from your own site.